What's a Common Cold and Cough? A common cold is called so because it's the commonest of all ailments and affects most of us more frequently than any other ailment. Throat irritation and blockage of the nasal passage usually accompanies a cold. It may also be accompanied by a cough which is the secretion of mucus due to infection of the lungs. 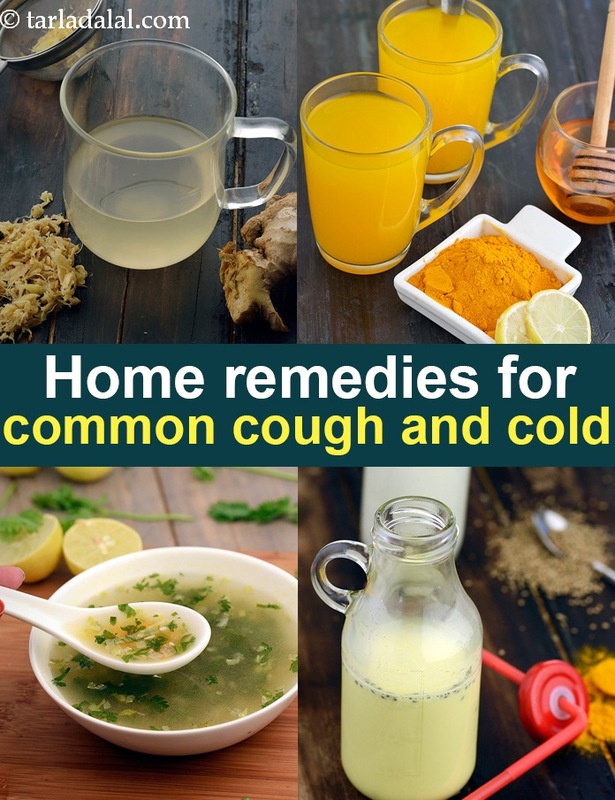 What causes Cold and Cough? There is no exact reason for the cold and cough. Its causes can vary from an allergy,influenza, sinusitis or a viral infection. Here are some soothing natural remedies that will help keep you smiling through the cold. 1. Vitamin C rich fruits: Vitamin C rich fruits such as oranges, sweet limes, strawberries, lemons etc. are extremely effective in treating and keeping cold and cough away. The high amount of vitamin C in these fruits increases the body's resistance to virus and decreases the duration of the illness.An easy way to enhance your intake of vitamin C is to squeeze a lemon in a glass of warm water, sweeten it with a tsp of honey and drink it twice daily for at least 3 days. 2. Garlic (Lehsun) : Garlic is a real immunity booster. Finely chop 2 to 3 cloves of garlic and swallow it like any other medicine. It can also be used raw into salad dressings. Crushing a clove of garlic into soups, stews etc. is also effective and greatly enhances their flavour. 3. Ginger (Adrak) : Cut about 10 grams of ginger into small pieces and boil in a cup of water. Strain, add a tsp of sugar and drink it while hot. You can add finely chopped ginger and garlic to soups like we have done in Mixed Vegetable Clear Soup. 4. Turmeric powder (Haldi) : Turmeric is most effective in curing throat irritation during colds. Fresh turmeric powder and ajwain (carom seeds) mixed in a glass of warm milk taken once or twice a day is the most useful curative measure. 1. Consume plenty of fresh fruits and vegetables as they abound in nutrients which strengthen the immune system. Try not to cook the vegetables for a long period as it results in loss of volatile nutrients like vitamins B and C.
2. Drink plenty of fluids (water, vegetable soups and fruit juices) as they help to replenish the fluids lost during the illness. 5. Take rest as it gives your body a better chance to fight the virus. 6. Stay away from a dusty environment as that can aggravate the situation. Raab is very good for cold as well it is very useful for new mother, for it enhances milk production. For serving smaller kids, one can remove clove or can reduce the quantity of hot herbs/spice. Turmeric powder is not just a spice powder, it has properties that are an effective remedy for cough, cold and throat irritations. When combined with honey it becomes a soothing natural remedy to keep cold and cough at bay. This paan is an immediate remedy for stomach aches. as this paan also cures in-digestion. children may be given this paan as it activates hunger. since the scented lime contains calcium,it is good for anybody eating the paan.